You sit back, take a sip of Gin and Tonic (for the mozzies; obviously) and chew on a slice of biltong. Overhead, a Fish Eagle declares air superiority over the river, and somewhere a catfish swallows a small fish. A crocodile gently slips into the water, the wake it causes belies its mass and sinister power it possesses. As the river laps against the fibreglass hull, a small commotion catches your eye. From the reeds, there where you least thought a bird would be, a red-beaked missile erupts. Paddling furiously with bright red webbed feet, it scrambles for the safety of an overhanging tree; your binoculars around your neck and your camera, still switched off, on the table in front of you. That was it… all of it! 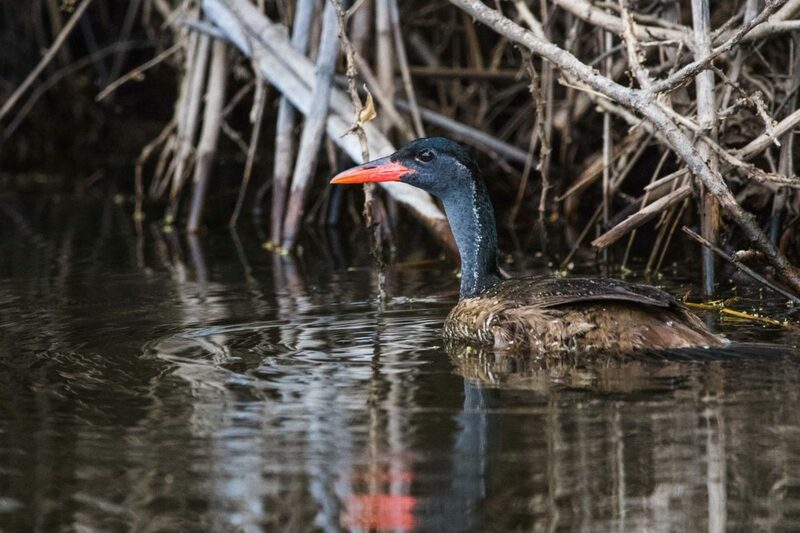 The African Finfoot is one of those very shy species that prefers hiding in plain sight. It is striking. Red bill, white streaks down the sides, dots on the back. A quick lesson in Bi nominal names: Pedica senegalensis is what we call it in formal papers, with Padica- “please look at my feet” and senegalensis-“from Senegal”; where it was first described to science. The Finfoot family is very old too- the first fossilised Finfoot was recorded in strata from the Miocene period, almost twenty-three million years ago. Although never plentiful (it is indicated on the Red Data List as ‘rare’), Kaingo has a stable population of these birds. It feeds on spiders, crabs, snails, frogs, fish, snakes…the stuff we would normally shunt as food. Being so secretive, we have never seen them feeding. Very occasionally, we do however have the half-chance of nabbing a photograph of one. The resultant photo you see with this blog! We floated closer to the scraggly tree that the Finfoot escaped into. I was hoping for another shot. Cameras were ready. The pole I use for silent approaches disappeared into the green/grey water. Found earth. It plopped into the water from an overhanging branch. I missed the shot, being poleman instead of having my camera ready. But everyone else got theirs! It sounded like automatic gunfire, the way that the Nikon camera worked its shutter. True to its nature the Finfoot, disturbed for the second time, took off. It dove underwater only to rise in a clump of reeds far ahead of us. We left it there, returning to our Gin and Tonic and biltong. We got the shot; our goal was reached. We have a photograph of an African Finfoot.